Desert Island Discs: “Headquarters” by The Monkees (1967) | Name-Brand Ketchup. By now everyone knows the story of The Monkees. The band was assembled through auditions from an ad in the trades, like Led Zeppelin. They gained their initial fame through a TV sitcom, like Rick Nelson. They used session musicians in the studio, like.. well.. everybody in the ’60s. And then, while on tour, they discovered in a record shop that their second LP had been released without their knowledge. And they staged a palace revolt against the star maker machinery. 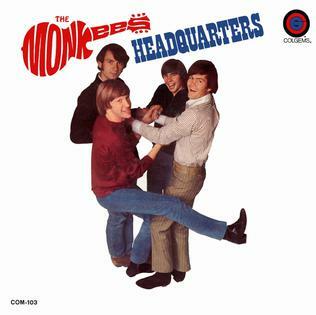 In 1967, one of the best years ever for rock’n’roll, “Headquarters” debuted on the charts at #1. It stayed there for a week until knocked off by.. anyone? anyone? Bueller? Bueller?.. “Sgt. Pepper.” It then spent eleven consecutive weeks at #2, all through The Summer Of Love. Suddenly, it became very uncool to diss The Monkees. And let’s face it, not every kid was ready for “Sgt. Pepper” in 1967. Mike sowed the seeds for country-rock with his songs on “Headquarters.” I mean, banjo and pedal steel on a teenybopper pop record?! How could they?! All his contributions are first-rate, but my favorite is “Sunny Girlfriend.” Mike was the most adept of the four in writing lyrics: this is a great song about the head rush of new love. Peter Tork and his roommate wrote “For Pete’s Sake,” and Peter gave it to Micky for the lead vocal. It later became the closing theme for the TV series. Even though nowadays the lyrics could serve as a Sunday school lesson, it was quite folky and trippy in the ’60s. Davy Jones, the teen heartthrob of the band, turns in a contemplative soulful ballad in “Early Morning Blues And Greens.” I think Lou Rawls or Percy Sledge could have taken this one to the top of the charts. “Randy Scouse Git” was written and sung by Micky. It was inspired by a trip to London, where the band had audience with who else but The Beatles. (This inspired the line, “The four kings of EMI are sitting stately on the floor.”) The title loosely translates to “horny Liverpool idiot.” Needless to say RCA demanded an alternate title for just the UK release. So Micky renamed it… “Alternate Title.” And it reached the Top 5 there. And of course there’s “Zilch,” one of the first ever recorded rap songs. Four nonsense lines that drove high-school bus drivers crazy in my formative years. In the summer of ’67, my family was moving from the rural house I grew up in to a metro-area suburb. Life was, to put it mildly, chaotic. I was in the right place at the right time for this album, and it’s been one of my benchmarks for music ever since. Even the warm fuzzy teenybop songs (like “I Can’t Get Her Off My Mind”) are ones any band looking for a Top 40 hit would have happily rescued from the dustbin in 1967. The Monkees went on to make more albums and rack up more Top 40 hits, but none had the impact of this one. “Headquarters” is the album that proved they were a real band. I was seven in 67, I wasn’t aware that the Monkees were said to be a “fake” band until much later. I never believed it. They might not have been the best musicians and they were given a big jump into the spotlight because of the TV show, but they really did do all those concerts and wrote lots of the great songs and were talented artists, every one of them. I loved them all, especially Mike and Mickey. Take a look at this discussion board. A great back-and-forth about The Monkees and the R’n’R HOF.